Whooo, there's Arya and Sansa in the opening scene. I believe this is the best one so far. The graphics are less irritating and the story pace picked up a notch, making me finish this one in less than ten minutes. The Hound looks exactly like I would've pictured him from reading the books. Khal Drogo looks amazing(ly hot). 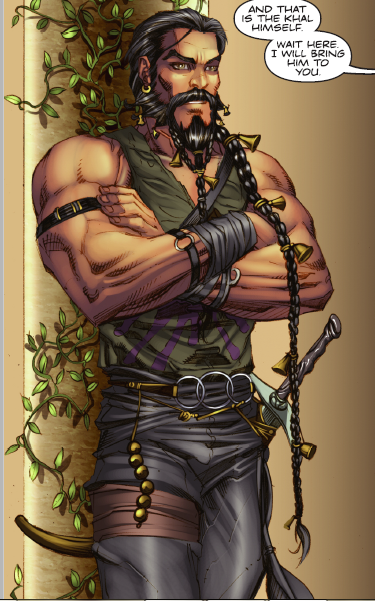 This drawing is actually from the first issue, but who cares: hawtness! There are quite a bit of boobies in this one, but so are there in the normal books and, well, hello HBO(OB). I'm giving this one 4 brownies.